Designed and machined in-house by TYGA from aircraft spec 6061-T6 alloy. FEA tested and developed for increased strength without unnecessary weight increase. They are delivered ready to fit with all necessary bearings and lower seal, and even an aluminium top clamp nut, to complete the transformation. The top clamp has the 'bolt-on' ignition switch/ lock holder fitted, which can be removed for racing. The Steering stoppers are reversible, giving maximum steering lock for street application, or a reduced angle for racing. Note, we recommend using Handlebar set 48 mm. 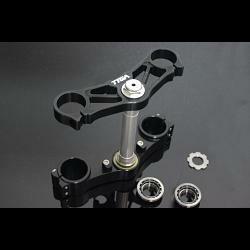 TYLY-0012 when installing this triple clamp set for best clearance issue with the NSR fairing. Lower clamp pinch bolts: 23Nm. Top clamp pinch bolts: 23Nm.